It’s always fun to venture to the Sleaze Roxx‘s World Headquarters also known as a mailbox in a small store to see what the mailman has brought. This time it was American Bombshell‘s debut album No Regrets. I had actually come across these guys before and posted about them on Sleaze Roxx while enjoying their “No Regrets” song. Although I had made a mental note to follow up and check out their album, I inexplicably forgot to do so. I suspect it was because American Bombshell‘s album only seemed available digitally at that time. There are admittedly many Sleaze Roxx writers that enjoy getting their music digitally but I am just not one of them. Call me old fashioned if you will. 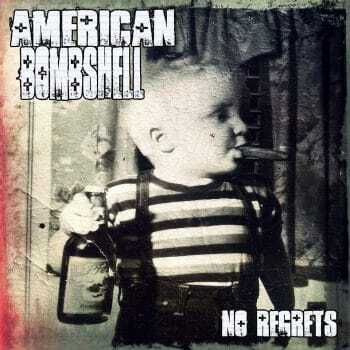 In any case, I was quite pleased that American Bombshell sent a physical copy of their album No Regrets for review. With the Indianapolis, Indiana, USA based group set to open the first day of the Rock N Skull Festival in Joliet, Illinois, USA in less than two months, getting familiar with the band’s songs was definitely a good idea. Funny enough, American Bombshell‘s moniker is “Making Rock N’ Roll Great Again” and let me tell you, they certainly live up to those words with their debut album No Regrets. And just to warn you, this is not a pretty dose of rock n’ roll with beautiful melodies and harmonies. This is in your face, relentless, sleazy dirty rock n’ roll that just never lets up. No Regrets starts off with the aptly named “Tattooz ‘N’ Booze” which reminds me a lot of when the now defunct 21st Century Goliath released their debut album Radio Destroyer which was full of piss and vinegar, and before the latter band lost a bit of its edge with slower mid-tempo rockers on its subsequent release. “Tattooz ‘N’ Booze” would have fit right in on 21st Century Goliath‘s Radio Destroyer, which did end up #7 on Sleaze Roxx’s Top Ten Albums of 2012. Do you get where I am going with this one? After a stellar sleazy opener, the question is of course can American Bombshell keep it up? The answer is mostly “yes.” As previously stated, American Bombshell are relentless and never let up. They do hover a little bit too much into “modern” sounding on some tracks foregoing melody and killer hooks for bland heaviness. “Party In Hell” is the most guilty track in that regard and really the only blemish on an otherwise very good album. Another “knock” on No Regrets is that there is seemingly no real standout track — the anthem if you will — but what you do get is, aside from “Party Like Hell”, is one solid track after another. American Bombshell do have a few layers to them as they prove on “So Broken” — a bluesy number that may well remind you of Badlands. I think what makes American Bombshell‘s No Regrets so special is lead vocalist Jay Cee‘s singing. The guy just seems to have the perfect voice to complement American Bombshell‘s sleazy and powerful brand of music. “Making Rock ‘N’ Roll Great Again.” American Bombshell are damn right! It ain’t pretty but these guys certainly know how to get the job done! I can’t wait to see whether these guys can deliver live as well. http://www.KrankTV.com – American Bombshell – “No Regrets” – Like this video? Come see thousands more at the Net’s largest, uncensored, completely d.i.y. music video site, KrankTV.com! We’ve got News, Games, Contests and the stuff that we can’t show on YouTube! Free! Uncensored! Retarded! KrankTV.com!